Priya Khanna is an Advocate and a Legal Consultant providing independent consultancy legal services with a niche focus on laws pertaining to sexual harassment of women at workplace. 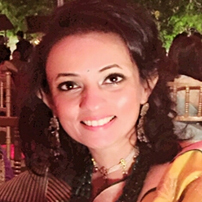 In addition to her legal qualifications, Priya is also a certified Image Consultant of Soft Skills Trainer certified by National Accreditation Board for Education and Training (NABET) and the Scottish Qualifications Authority (SQA). Invigorated with her vast global exposure and immaculate communicative and organizational skills as well as refined client counselling abilities and interpersonal skills, Priya is a creative and versatile professional with a proven record of achievements. Belonging to one of the most well known family of lawyers in India has added to her credibility and goodwill. Her father, Dr. Lalit Bhasin is one of India’s most revered lawyers of international acclaim with a career spanning over 55 years.